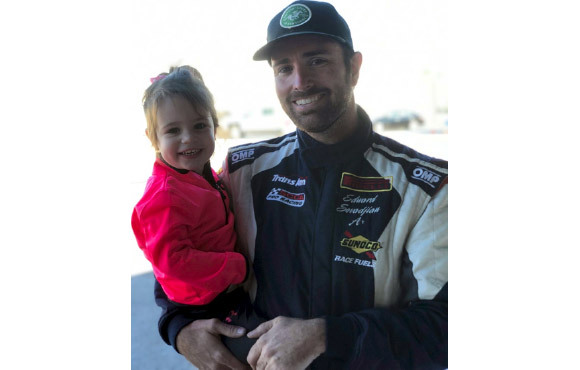 This would be Edward’s third Trans-Am 2 race in 2018, and although the car is four years old, he typically runs in the top ten. After finishing in the top 8 in all practice sessions, Edward went backwards in qualifying where he slotted in 15th. Early in the race Edward reported the power steering was shaking in his hands, and was advised by the crew chief to park the car. Instead he continued, and at about the halfway point in the race, he had worked his way up to 7th. There was a great battle for third, with third through 10th all running nose to tail and trading places. Just halfway through the race our power steering ram mounting bracket finally broke off, and Edward was forced to retire the car. We were looking good for a top five finish and had a shot at third had the car finished the race. This was Edward’s daughter River’s first race. This was Mecca’s first race after a frame up restoration. 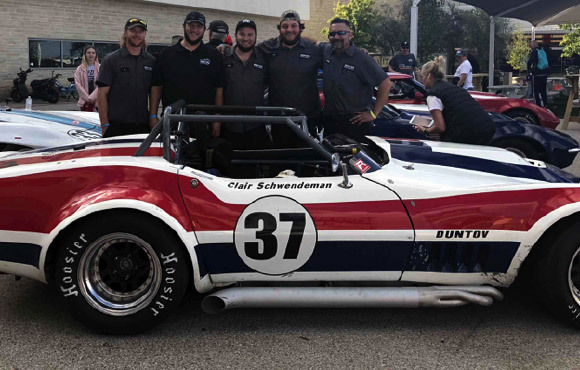 Colby Hillman’s historic Mecca Corvette had undergone a total restoration prior to the 2017 COTA race, and hadn’t raced since. This car was well balanced right from the first session and Colby ran in the top half of the field all weekend. If you consider that this car is a Gold Medallion prepared entry, it would put Colby right at the front of this category. In addition to its strong pace, the car also won the Group 6 small enduro National Championship. Clair Schwendeman led that race for 40 minutes, and brought it in for his mandatory 5-minute pit stop with a 30 second lead. Unfortunately a botched fueling operation eradicated the majority of that lead and Edward (who was co-driving the Mecca entry) passed Clair’s co-driver (the author) four laps into his stint. Shortly after that, Alan parked the car on the side of the front straight with an electrical issue. Mecca proceeded to lap every other car in the race with the exception of a 1968 Brabham F1 car that was inexplicably put in with the small block production cars in the ‘little’ enduro. As to the 2018 Group 6 National Championship, typically the largest field and the best turnout of talent and equipment in vintage racing, the event didn’t exactly live up to its billing. 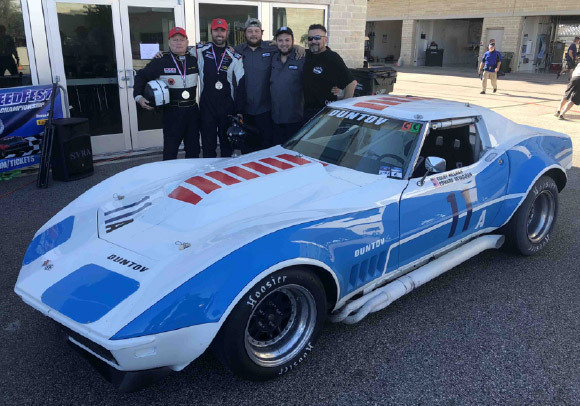 Instead of the fastest cars and the best drivers in the country competing for a coveted National Championship, this year’s event was lacking the winner of the previous 3 COTA races. A week prior to the race, Jim Kitzmiller withdrew his entry into the race so Edward was not in the field. 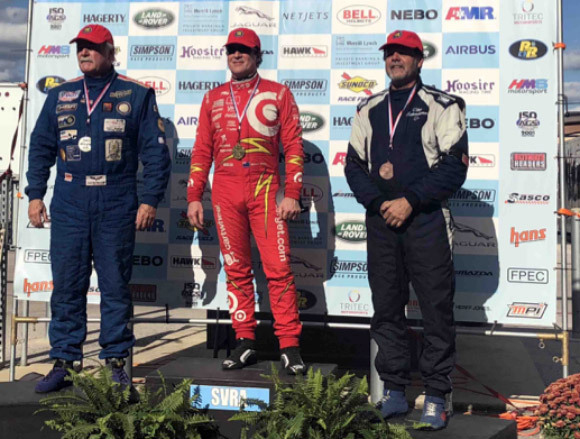 Since last year's race, SVRA added 200 lbs to all of the quick Corvettes, including Kitzmiller, Jody O’Donnell, Peter Klutt and Mike Donohue. It was an effort to tighten up the field, and a 200 lb penalty was also given to Clair Schwendeman’s Corvette that had finished 9th the last time he ran it at COTA. With no weight penalty, Gary Klutt, a veteran NASCAR driver and son of Peter Klutt, ran right up with Jody O’Donnell, and in fact ran right into Jody, and Klutt put him into the wall at turn one, lap one. He then ran away with the race, but was later disqualified for aggressive driving. Jody’s car after Gary Klutt knocked him right into the wall. After Gary Klutt and a Cobra were disqualified, Scott Borchetta in an ex Duntov prepared #05 1972 Corvette ended up finishing first overall and he won the BP National Championship. The Duntov crew, L-R, JD, Steven, Jake, Luke, and Jeffrey, behind Clair’s car with ballast. 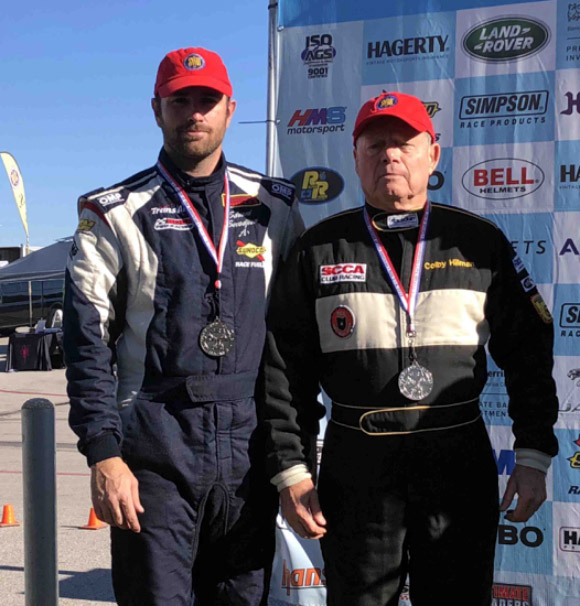 First in AP and second overall was pro racing and perennial SCCA National Champion John Heinricy, who drove Jim Sandberg’s big-block Corvette. John’s fastest lap was a 2:29.1, which was six seconds slower than last year’s fastest lap. 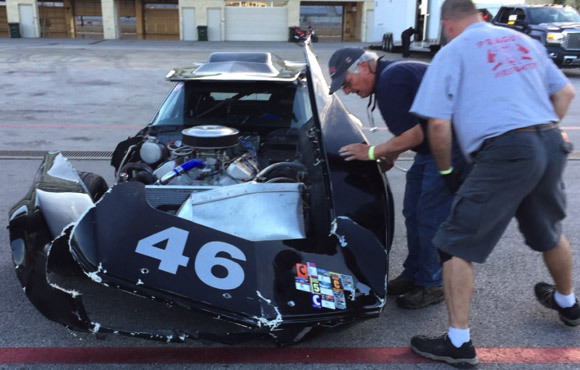 In 2018, the fastest big block Corvettes were all sidelined; Kitzmiller’s by admin, O’Donnell’s by getting rammed into the fence, Gary Klutt by doing the ramming and getting disqualified, and Peter Klutt by an engine issue. The ballast carrying Mike Donohue (left) and Clair Schwendeman (right) were second and third in BP, and third and fourth overall. It was a strange and disappointing race, to say the least.